REHOMED! 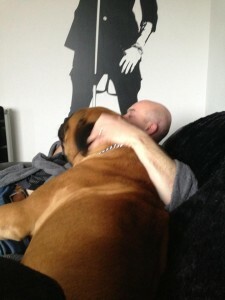 JJ now lives with Rob and his sister Lexi the ABD! JJ is a big handsome boy! He is looking for a home after a tragedy struck his family. He has lived with small children and is great with other dogs if a little dominant. JJ is an avid guarder so needs keeping in line at all times. He needs a home where there is a male present as he appears to not listen to females at present although his foster home is working on this. At home he is extremely loving and loyal and loves to be cuddled. 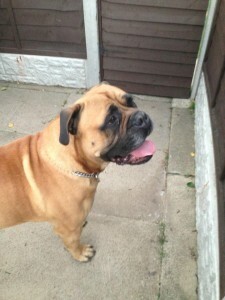 We need a breed experienced home for JJ due to his guarding instinct and his sheer size. 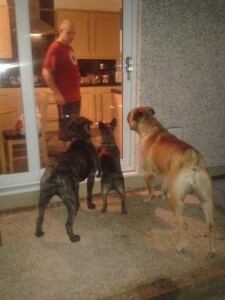 JJ with Lola and Jeffrey hoping his foster Dad Simon will let him in! !